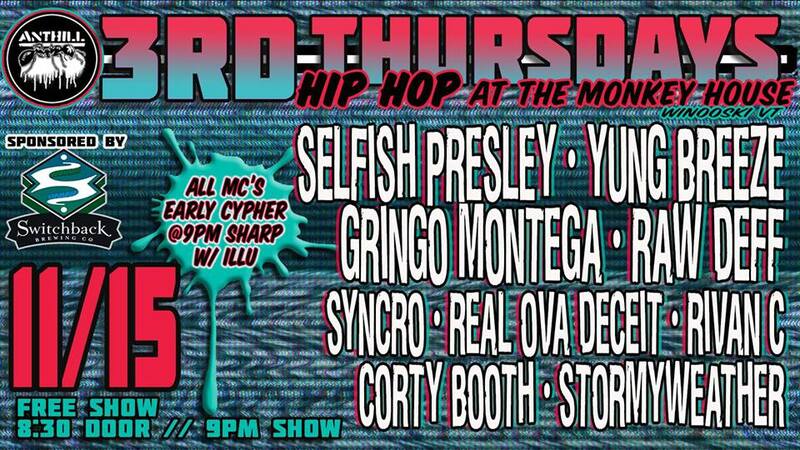 Generously sponsored by Switchback Brewing Company - 3rd Thursdays is Vermont’s only long-standing hip-hop showcase. Held down at The Monkey House every month by the venerable DJ Kanganade and hosted by members of the Anthill Collective, the event serves to highlight local and touring acts once a month on the… yeah, you get it. This month we have A LOT of brand new faces. We reached out to the community via Vermont Hip-Hop Artists Collective this month and the response was overwhelming!!! Come see a ton of new, young, fresh performers brand new to the 3rd Thursday stage and welcome them into the fold. Storm Lathe, Corty Booth, Rod Realovadeceit Senter, Rivan Calderin and Syncro all hit the stage for the first time!! We also have the return of the So.802 Studios family, which is always something special. For too many years it was as though VT had two hip-hop scenes, south and north, but over the past several years, starting with Sound Affects (big ups to Rob Mertz #spreadgoodmusic) we have united VT under one roof many times. #VThiphop is alive and well and whenever these dudes hit it up here, you can tell. We've got Yung Breeze, Gringo Montega, Selfish Presley and Raw Deff all headed up for this one. If these 4 dudes all take the stage together... danger!